Liberty Head Eagles with motto make up the second variety within this series. 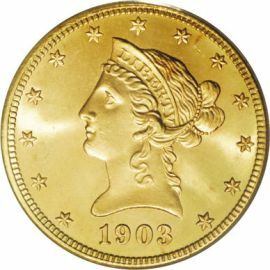 These gold coins were produced at the US Mint from 1866 to 1907 and designed by Christian Gobrecht. The obverse of this coin shows Gobrecht's rendition of the American icon surrounded by thirteen stars representing the 13 original colonies. The date also appears at the base of the obverse design. 1866. The reverse of this coin shows an eagle with wings spread, clutching an olive branch and arrows in its claws. 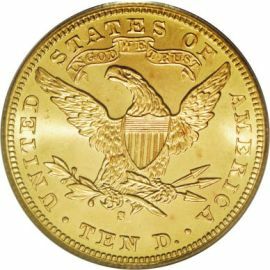 The inscriptions read "UNITED STATES OF AMERICA" and "TEN D." around the periphery of the coin. Also, as stated above the motto "IN GOD WE TRUST" is on a banner between the eagles wings.